Tiger Dead, Tiger Dead and As You Like It. Strange Heading I know but these are our two latest favourites from the BIG CAT reading series. We don’t follow a set reading scheme as such we tend to dip in and out of different ones and select books that we think the kids will enjoy, so far we have been very impressed with the few BIG CAT readers that we have used and these two new ones are popular with both the kids and myself (because let’s be honest when you are helping with reading everyday it makes a big difference when you find books that both the kids enjoy and that you, the one listening to it enjoys or can at least tolerate). Tiger Dead ! Tiger Dead ! Stories from the Caribbean (Band 13 Topaz). There are actually 2 stories in this book and both are sweet. The first one is about a naughty Tiger who decides he is going to pretend to be dead so that all the animals will come to his house to pay their respects giving him the opportunity to eat them all. While making his plan out loud, Anansi the spider-person overhears it and makes it his mission to reveal the truth. Both my kids love animal stories and this one was perfect for them. They loved the fact that a spider managed to destroy the tigers plan (small creature verses strong creature). And you know it is a hit when you find your kiddie reading the book first thing in the morning, still in his PJ’s and yes he likes sitting on a Pilates ball to do his reading. We thought it was well written and the illustrations were amusing – my son loved the picture of the Anansi eating with all his arms. The second story in the book was Owl and Belle-Belle. This one especially appealed to my daughter. Owl thinks he looks strange with his “puffed-out cheeks and popping-out eyes” – we loved this because both my kids adore owls and both immediately commented that Owls are stunning birds. So straight away we were chatting about loving yourself for who you are and not trying to be someone else. And how different people interpret things differently. Owl is so self-conscious that he hides his face under a big hat and does not come out much during the bright light of day. But Belle- Belle adores owl anyway and ends up marrying owl. All in all a lovely story with some great life-lessons worked into the text. And at the end of the story they include a Feelings Roller Coaster which we loved as we used it to talk about all the different feelings throughout the story. As You Like It – a BIG CAT Shakespeare story. Now total honesty here we have never read any Shakespeare stories with the kids before and when I first got this I was not sure. So I just left in the bookcase (I think there was part of me that thought Shakespeare was just too advance for the kids). But my daughter picked it up and read it cover to cover. She had a number of questions about the characters in the book and why they were behaving strangely – why did everyone want to kill each other over silly arguments? But she finished the book, we chatted about the story and I actually read the book myself. It is a very accessible version of the Shakespeare story, totally suitable for the kids. I am very impressed with this version and after reading the book I want to get more of these Shakespeare stories for the kids. I think it is a fantastic way of introducing Shakespeare to them now so that later when we do study it the stories will be familiar and it will not be intimidating for them. For more on the books in the BIG CAT reader series you can look at the Collins website here – BIG CAT readers. Collins do have some worksheets linked to their readers which are FREE to download but I have checked and currently there is nothing for these two books. I did receive both my books from Collins. 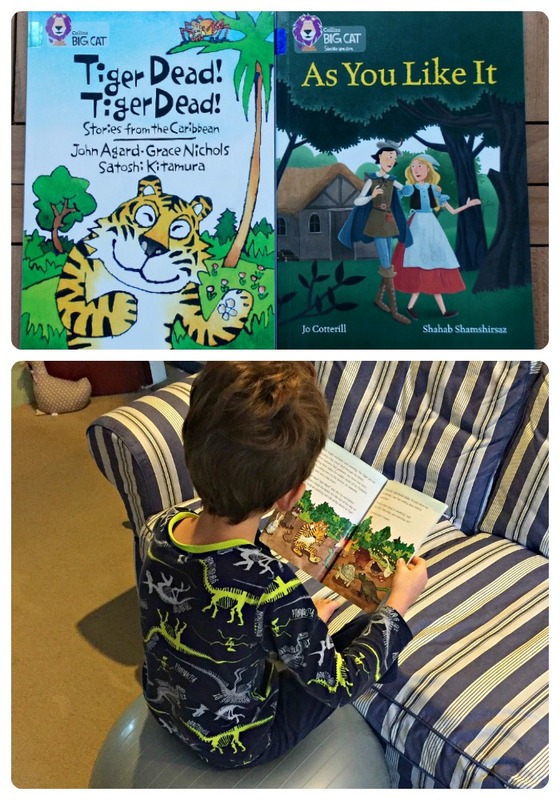 This entry was posted in Book Ideas and tagged Big Cat readers, children's book, home education, homeschooling, readers, reading books, Shakespeare. Bookmark the permalink.